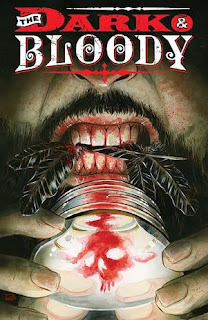 On February 10, ‘The Dark & Bloody,’ a new haunting monthly horror comic series from writer Shawn Aldridge (Vic Boone) and Scott Godlewski (Copperhead), with covers by Tyler Crook (Harrow Country), will join Vertigo's refreshed slate of titles. Guns, moonshine, monsters–there’s a lot going on in the backwoods of Kentucky. Iris Gentry is a war vet who returned from Iraq to find his options for feeding his family limited. Since they live in a “dry” county, Iris has turned to running moonshine for his former ranking officer–meaning the men now share crimes at home and abroad. You see, back in their combat days, Iris’ regiment got involved in something they shouldn’t have, and now a deadly, otherworldly consequence has come looking for vengeance. "The inspiration came from my own childhood in Kentucky, local folklore like the Bell Witch, and Southern Gothic fiction," stated writer Shawn Aldridge. "I tried to distill what I loved and feared growing up in and around the woods into this story. Granted I never made moonshine or had to protect my family from a demon hellbent on my death, that I created for the story." "'The Dark & Bloody' is right in my wheelhouse, artistically. It's exciting to be working in the horror genre again and I think readers will really dig what we're doing," mentions artist Scott Godlewski. Lookout for the new series when it hits shelves in February.